People: John Logan (Brown University), Zengwang Xu (University of Wisconsin, Milwaukee) and Brian Stults (Florida State University). The tract data for 1970-2010 that are included in the LTDB standard data set were prepared by Miao Chunyu (Brown University) from files downloaded from the NHGIS. Logan, John R., Zengwang Xu, and Brian J. Stults. 2014. 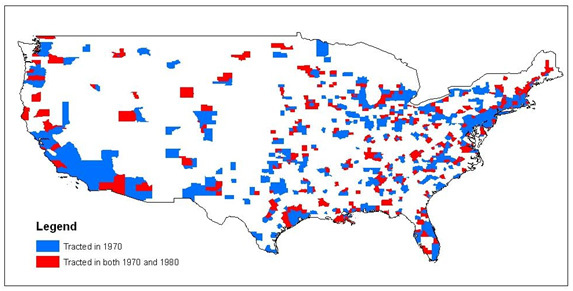 "Interpolating US Decennial Census Tract Data from as Early as 1970 to 2010: A Longitudinal Tract Database" The Professional Geographer 66(3): 412�0. (Click here to download). Logan, John R., Brian J. Stults, and Zengwang Xu. 2016. "Validating Population Estimates for Harmonized Census Tract Data, 2000�10" Annals of the American Association of Geographers. http://www.tandfonline.com/doi/full/10.1080/24694452.2016.1187060. The continual change in geography between successive censuses is a major barrier for longitudinal analysis. Census tracts are fundamental enumeration units for the U.S. decennial censuses and their boundaries very often change over time. In every new census many tracts are split, consolidated, or changed in other ways from the previous boundaries to reflect population growth or decline. Here we present the Longitudinal Tract Data Base (LTDB), which provides public-use tools to create estimates within 2010 tract boundaries for any tract-level data (from the census or other sources) that are available for prior years as early as 1970. We also provide a Backwards LTDB in which data provided in 2010 tract boundaries can be estimated within 2000 boundaries. Researchers increasingly work with information aggregated to the tract level from non-census sources, such as criminal justice, public health, and voting records. To meet their needs requires a tool to convert such data to the 2010 boundaries. The LTDB offers an open-source crosswalk to link data from 1970-2000 to 2010, and it also provides user-friendly programming code to bridge data across years. The LTDB is described in detail in Logan et al 2014 (see above). A subsequent article (Logan et al 2016) compares the LTDB estimates with those provided by Geolytics (formerly the NCDB) and another source provided by NHGIS. Based on our analysis we do not recommend the Geolytics data set. The NHGIS and LTDB estimates are very similar. Users should read the Annals article to make choices about what data to use and what precautions are needed when using any estimates. Note that much of the U.S. was not divided into census tracts in 1970, and even in 1980 many less populated areas were not tracted. Consequently many 2010 tracts will have missing values for 1970 and 1980.